Acupuncture is a type of healing that treats patients by insertion and manipulation of solid, generally thin needles in the body. Acupuncture points are areas of designated electrical sensitivity. Inserting needles at these points stimulates various sensory receptors that, in turn, stimulate nerves that transmit impulses to the hypothalamic-pituitary system at the base of the brain. The hypothalamus-pituitary glands are responsible for releasing neurotransmitters and endorphins, the body's natural pain-killing hormones. It is estimated that endorphins are 200 times more potent than morphine. 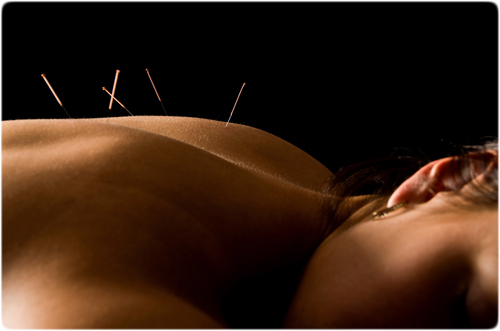 Through its origins, acupuncture has been embedded in the concepts of Traditional Chinese Medicine. Acupuncture is based on the premise that bodily functions are regulated by the flow of an energy-like entity called "QI". Acupuncture aims to correct imbalances in the flow of qi by stimulation of anatomical locations on or under the skin called acupuncture points, most of which are connected by channels known as meridians. I am afraid of needles. Will it hurt? Acupuncture needles are 25-50 times thinner than a hypodermic needle. They are so thin that several acupuncture needles can go into the middle of a hypodermic needle. The needles used in acupuncture are sterilized, disposable, stainless steel and thinner than a shaft of hair. There is little sensitivity to the insertion of acupuncture needles. The needles are left in place for twenty to thirty minutes. Most people find the experience extremely relaxing and uplifting or describe a heightened awareness of the connections within one's body. Many experience a state of general relaxation and even fall asleep for the duration of the treatment.